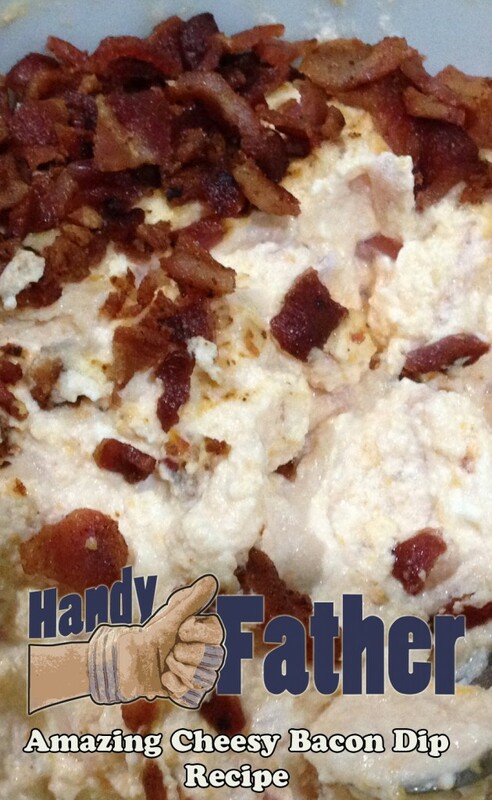 A few weeks ago Handy Father came across a dip that looked pretty good, but I wanted it to be an Amazing cheesy bacon dip recipe. Handy Father made a few alterations to the original cheese bacon dip. More bacon. More bacon. Pre-heat oven to 350º. Combine the sour cream, cheddar cheese, the chopped onion, and the cream cheese. Mix together until everything is evenly distributed. Bake in an oven-safe bowl for 35 minutes. While baking, cook and crumble 1lb of bacon. After the 35 minutes, stir the dip well, mixing in 1/4 of the bacon. Then top dip with the rest of the bacon and serve hot with crackers. It is also quite good with vegetables or on bread. This amazing cheesy bacon dip recipe will serve 10-12, and goes great with a Virgil’s Root Beer.